I had no idea frankfurters could be so spectacular. Wow! 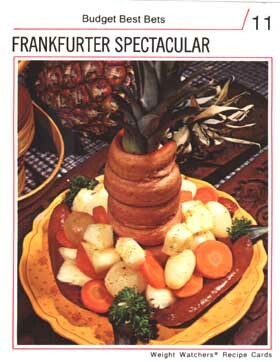 I would almost be willing to upholster a whole damn pineapple with pork product just to be able to say I was serving Frankfurter Spectacular. Say it with me: Frankfurter! Spectacular! Why would you even want to eat this? Why, when you could keep your mouth busy for hours just by repeating the life-affirming phrase that is "Frankfurter Spectacular."